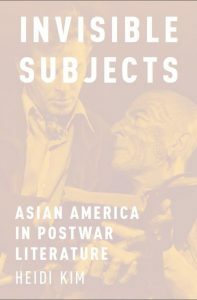 Released in 2016 from Oxford University Press, Invisible Subjects: Asian America in Postwar Literature. 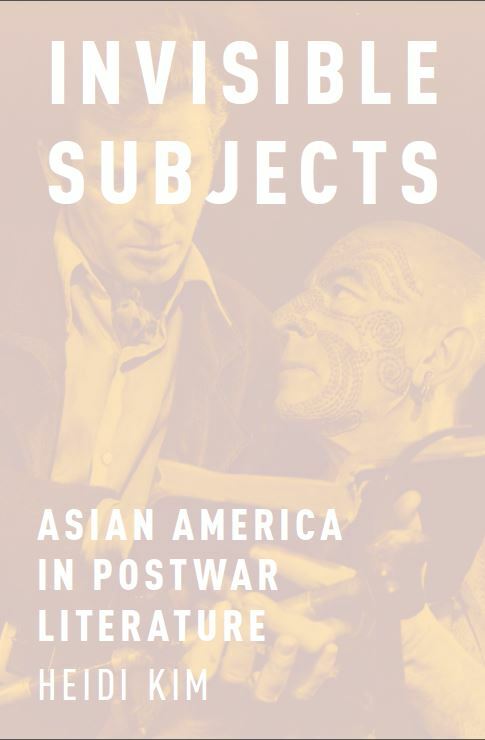 Invisible Subjects broadens the archive of Asian American studies, using advances in Asian American history and historiography to reinterpret the politics of the major figures of post-World War II American literature and criticism. Taking its theoretical inspiration from the work of Ralph Ellison and his focus on the invisibility of a racial minority in mainstream history, Heidi Kim argues that the work of American studies and literature in this era to explain and contain the troubling Asian figure reflects both the swift amnesia that covers the Pacific theater of WWII and the importance of the Asian to immigration debates and civil rights. From the Melville Revival through the myth and symbol school, as well as the fiction of John Steinbeck and William Faulkner, the postwar literary scene exhibits the ambiguity of Asian forms in the 1950s within the binaries of foreigner/native and black/white, as well as the constructs of gender and the nuclear family. It contrasts with the tortured redefinitions of race and nationality that appear in immigration acts and court cases, particularly those about segregation and interracial marriage. The Melville Revival critics’ discussion of a mythic and yet realistic diabolical Asian, the role of a Chinese housekeeper in preserving the pioneer family in Steinbeck’s East of Eden, and the extent to which the history of the Mississippi Chinese sheds light on Faulkner’s stagnant societies all work to subsume a troubling presence. Detailing the archaeology and genealogy of Asian American Studies, Invisible Subjects offers an original, important, and vital contribution to both our understanding of American literary history and the general study of race and ethnicity in American cultural history.